Filipinos living in the US are in for a big treat as Willie Revillame returns to North America for the much-awaited US launch of TV5 International, the global arm of the fastest growing network in the Philippines. The long wait is over for those who miss Kuya Wil and his signature brand of funny yet heart-warming entertainment. His beautiful co-hosts Mariel Rodriguez and Camille Villar and the rest of the Wil Time Bigtime gang will join the lovable host for this major event. As the countdown to the “Big Launch” nears, the whole Wil Time Bigtime crew keep themselves busy with daily rehearsals and preparations for “The Big Launch”. Kuya Wil promises to give US-based Pinoys an exciting concert event filled with games-galore and the audience should expect nothing less. By joining the contests, attendees will have a chance to win big prizes. Prizes at stake include a house and lot that they can win not only for them but also for a chosen beneficiary in the Philippines. 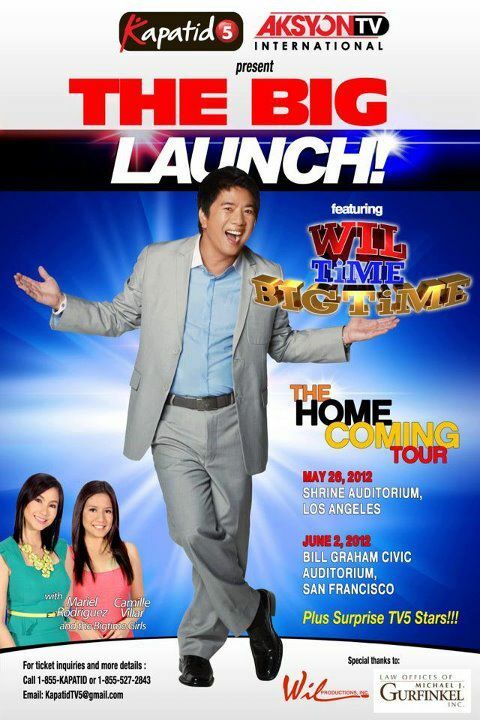 TV5 International’s “The Big Launch” begins on May 26, 2012 at the Shrine Auditorium in Los Angeles, CA and on June 2, 2012 to the Bill Graham Civic Auditorium in San Francisco, CA.